Brass Bands and Xenakis are not such a crazy mix. When Norway's Einkanger-Bjorsvik Band appeared at the Saturday night concert of the 2007 Brass in Concert Championships (the UK's leading brass band entertainment competition) they included in their programme Xenakis' Rebonds, played by one of their young percussionists. The audience was very appreciative (I have the DVD - http://www.worldofbrass.com/acatalog/26043.html). Actually, brass band audiences don't get enough credit for the breadth of repertoire that they will happily listen to. They will pack out a hall to hear an entertaining mix of styles from classical transcriptions to arrangements of pop tunes, and will be equally happy to listen to original works for brass, especially the test pieces that written for the major competitions. The test pieces are always highly virtuoisc and, while some of them are little more than showcases for the quiality of the bands, many test pieces are serious pieces of music and deserve a hearing. Composers like Philip Sparke, Derek Bourgeois and Edward Gregson have written complex and rewarding scores for brass band that would resonate more with the disenchanted Radio 3 audience than the many retreads of light classics that have pushed them away. This year there has been a lot of excitement in the band world over the test piece for the Norwegian National Brass Band Championships, Goldberg 2012 by Svein H. Giske. Here's a little information about the piece (translated from the Norwegian): http://bjorsvikbrass.wordpress.com/kven-er-med/kornett/svein-henrik-giske/english-goldberg-2012/. I am yet to hear it, but am very keen to do so. I'm hoping Eikanger or Manger takeit to the European Championships as their own choice work. As for Salvation Army Bands, have you heard one recently? Many SA bands (not just the the International Staff Band, but several strong corps bands like those of Hendon, Enfield and Kettering) play quite a variety of music. Yes, there are still hymn tunes and marches and song arrangements, but there are also big, challenging works for brass band that are influenced by the world of classical music. For example: The principal trombonist of the London Symphony Orchestra, Dudley Bright, has written a fair bit of music for brass band in various styles. His extended piece for the ISB, Pursuing Horizons, was premiered by that band last year as part of its 120th anniversary celebrations. It's not Xenakis, but it is neither is it light and fluffy. It is music of serous intent that deserves to be heard. Two important points come out of this path. The first is that brevity and the need to grab attention is a mixed blessing - but at least I didn't run the headline 'Naked Salvation Army band plays Xenakis'. The second point is that, as the email above tells us, the brass band community is producing music of serous intent that deserves to be heard - which is what this blog is all about. My thanks go to reader TP for bringing us back on path. 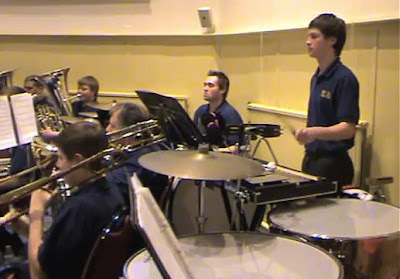 Header image is taken from YouTube and shows the Southern Band of the Salvation Army playing at Southsea Citadel. And this path leads on - Glenn Gould bequeathed half of his substantial estate to the Salvation Army. I had similar misgivings Bob - given my musical heritage too! The email you quote expresses it much more succinctly than I could. The writer is quite right about the versatility particularly of the Norwegian band Eikanger-Bjorsvik. Their CD of Prokofiev's Romeo and Juliet on the Naxos label is outstanding - if somewhat quirky as a concept. RVW also wrote a piece exclusively for Salvation Army bands in 1955 - Prelude on Three Welsh Hymn Tunes. He had been guest of honour at a concert by their International Staff Band and was impressed by them. Both Gustav Holst's A Moorside Suite and John Ireland's A Downland Suite were commissioned as test pieces for the annual National Brass Band Festival of Great Britain. Paul Dickens via Facebook:...and Elgar's Severn Suite for brass band draws on that material.